The 100 year old American Gothic building for Second Congregational Church in West Newton, designed by Charles Collens, is a testament to the gifted craftsmen of the time, including Charles Connick and Henry Wynd-Young (stained glass) and Johannes Kerchmayer (carvings). We will start with a look at the historic former parsonage just next door, continue to the façade of Second Church that was inspired by Salisbury Cathedral, and move inside to explore the beautiful symbolic and whimsical images created in wood, stone and glass. Location: Meet at the main entrance to Second Church, 60 Highland Street, West Newton. Park in the church lot. Taking place outside in the Durant-Kenrick gardens (weather permitting), this program starts with reading From Seed to Plant by Gail Gibbons. Then participants are invited to take part in a lively scavenger hunt around the grounds and the museum, and even plant some seeds in the garden. For children ages 18 months to 6 years and their caregivers. Includes free entrance to the museums after the program. World War I forged a new sense of identity for American Jews – one which saw military recognition and acceptance of Jewish soldiers, new philanthropic frameworks to aid Jews worldwide, and a feeling of patriotism and Americanness. Over 200,000 Jews served in the U.S. military during World War I, including Newton’s own Bernard Louis Gorfinkle. Stephanie Call of the Jewish Heritage Center at the New England Historic Genealogical Society leads us through the experiences of American Jews in World War I as told through Bernard’s story, as we follow him through the ranks of the 26th Yankee Division, from summary court officer, to Captain Judge Advocate, to participant at the Paris Peace Commission. On this day we will be reading Corduroy by Don Freeman, a tale of a teddy bear come to life. The Jackson Homestead has a whole gallery dedicated to historic toys, and in this setting preschoolers and their caregivers will be able to play with historic toys, and even design a toy of their own. For children ages 18 months to 6 years and their caregivers. Includes free entrance to the museum after the program. In the 1840s, Brook Farm was a utopian community for Transcendentalists including Nathaniel Hawthorne, who used it as the setting for A Blithedale Romance. Yet historical references to the area go back to 17th century preacher John Eliot. The land was also used as a poor farm, a training camp during the Civil War, and an orphanage. 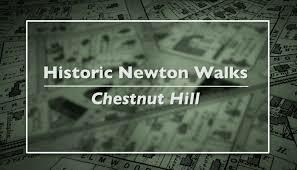 Learn about the layers of Newton history with former Newton South High School English teacher Dwight MacKerron as you walk through the site. The History Book Club of Historic Newton meets to discuss Appomattox: Victory, Defeat and Freedom at the End of the Civil War by Elizabeth Varon. The book explores the war’s final battles in Virginia, what the surrender meant, and the complexities of generals Lee and Grant. Free and open to all. In September 1774 the farmers of Middlesex County rose up and ended royal government in most of Massachusetts. For the next seven months, Patriot activists and the British governor raced to seize artillery. Cannon disappeared from ships, shore batteries, and even armories under redcoat guard. In Newton, citizens voted to form their own artillery company. Learn more about this dramatic time in American history as author J.L. Bell discusses his book,The Road to Concord, which uncovers the hidden history that led to the Revolutionary War. Bell is proprietor of the Boston1775.net website, an elected fellow of the Massachusetts Historical Society, and a Newton North High School graduate. Co-sponsored by Historic Newton.